Northern lights or auroras borealis take place when electrically charged particles from the sun travel in solar winds and interact with the magnetic fields of the Earth’s atmosphere. This creates an ethereal glow and dancing lights in the sky. 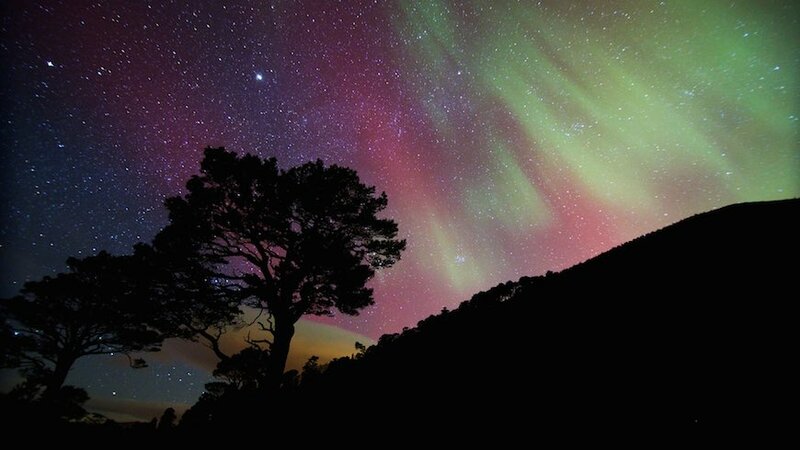 When can you see the northern lights in Scotland? Planning is the best way to increase your chances of seeing the northern lights. Follow @Aurora_Alerts and @aurorawatchuk for Twitter alerts. Our favourite website gives you the detail of when to expect the biggest magnetic storms. Don’t let a cloudy night ruin your chances of seeing something so spectacular. Check the weather for clear skies near where you are, or prepare to drive to a location where clear skies are possible. Did you know Scotland is renowned as one of the top places in the world to view northern lights? We are on the same latitude as Stavanger in Norway and Nunivak Island in Alaska, so we’re in with a good chance of spotting the lights. The best place in the UK are understandably the most northerly locations: Caithness, the North West Highlands, the Outer Hebrides, Shetland, Orkney, the Moray Coast and the Isle of Skye are all good spots to view the northern lights. Aim to get to an elevated position, well away from city lights and light pollution. 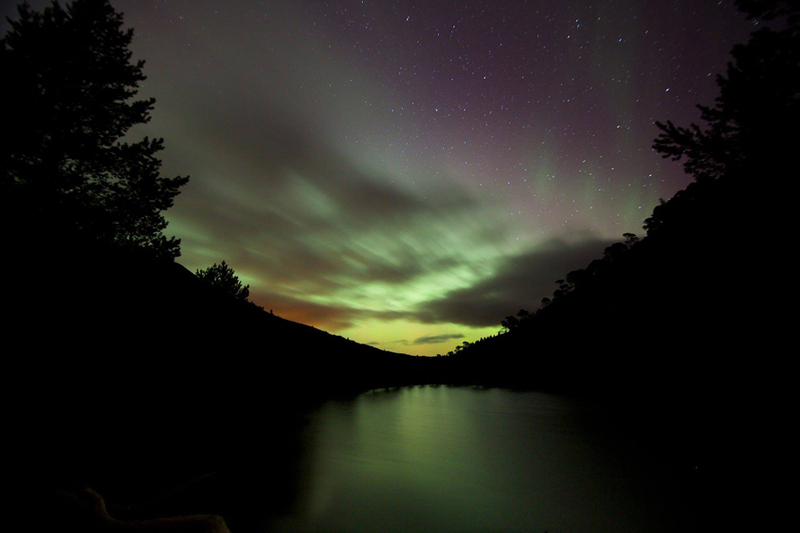 A large number of our walking holidays are based in the locations best known for the northern lights. 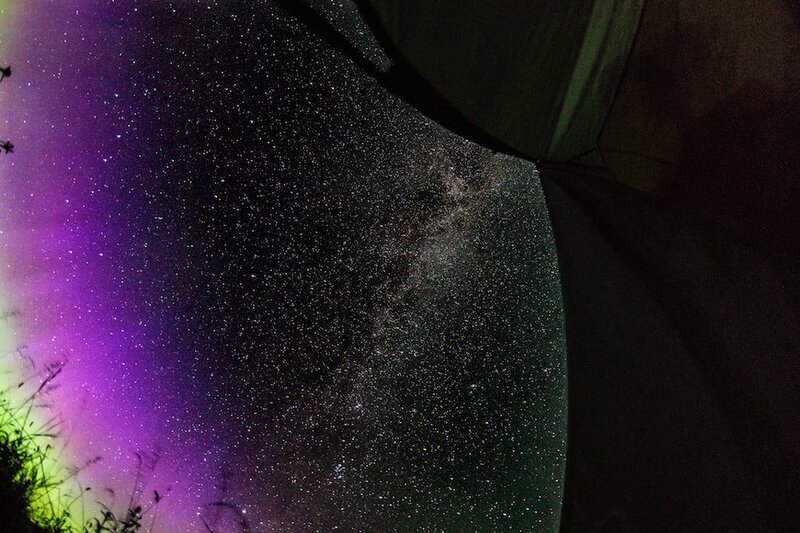 The Northern Lights Scotland and Milky Way from the door of a tent. 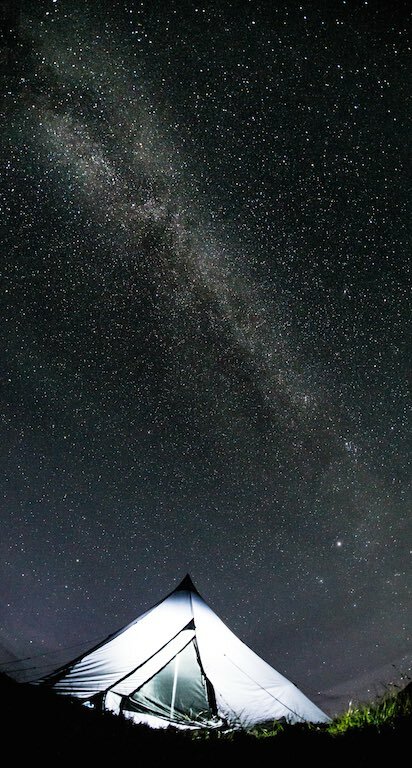 The Milky Way camping in Scotland. 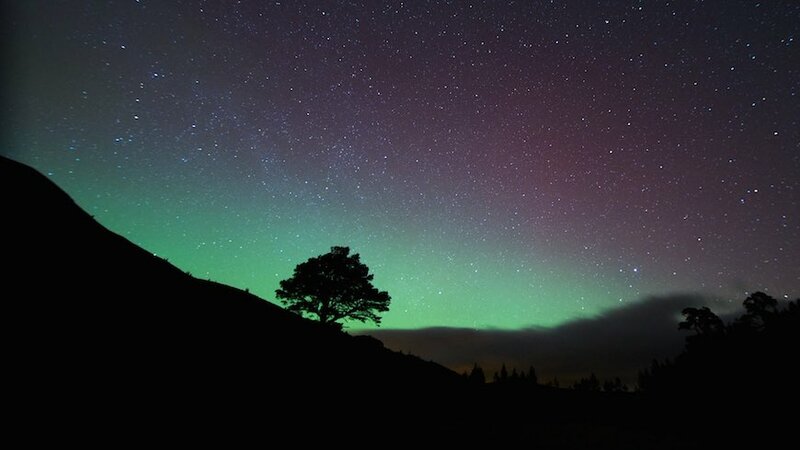 A lone pine stands silhouetted against the Northern Lights Scotland. Where should you position yourself? Once you’ve checked everything out and got into position it’s a case of waiting and watching. Certainly, the best time to see northern lights in Scotland is during long, clear, winter nights. Take a compass with you and point north, or look for the North Star (Polaris) and point in that direction. To find the north star look for the Plough and line up the outer edge and draw a line towards the edge of the Little Plough. The brightest star in the little plough is the North Star. If you’re into photography and have seen the stunning photos of the northern lights then take your SLR camera and tripod and make sure you open up the aperture and set the shutter speed to around 30 seconds. It’s likely to be chilly so wrap up warm. Pack warm clothes, hat, gloves, insulated jacket and waterproof trousers. Oh, and remember to take a torch. Don’t forget to breathe…it’s an incredible and awe-inspiring sight that lights up the magic of the universe. Cuddle your loved ones and enjoy the show. Admittedly we’d love the time to take more photos of the Northern Lights in Scotland as they are such beautiful images. If you see the northern lights in Scotland then don’t forget to tell your friends. Share your pictures and videos on Facebook, they’ll be just as stoked as you that you’ve seen them, it’s on a lot of people’s wish lists. Take a look at some of our shots. If you have any to share then post them to our Facebook or Twitter pages. And good luck with your own photos and northern lights spotting.